With the rise of data breaches and regulatory enforcement, businesses must acknowledge cybersecurity and data privacy issues as significant business risks. Business, client, and employee information are some of the most valuable resources a business holds, making them priorities to protect. Companies that fail to take proper precautions are more likely to fall victim to a data breach, governmental enforcement action, or class action lawsuit, each of which is costly and damaging. As businesses consider the actions they can take to protect against these threats, third party vendors are prime targets. Vendors are commonly used by businesses to perform all manner of valuable services, but they also carry with them significant risk. In fact, 63% of security breaches are caused by a third party. 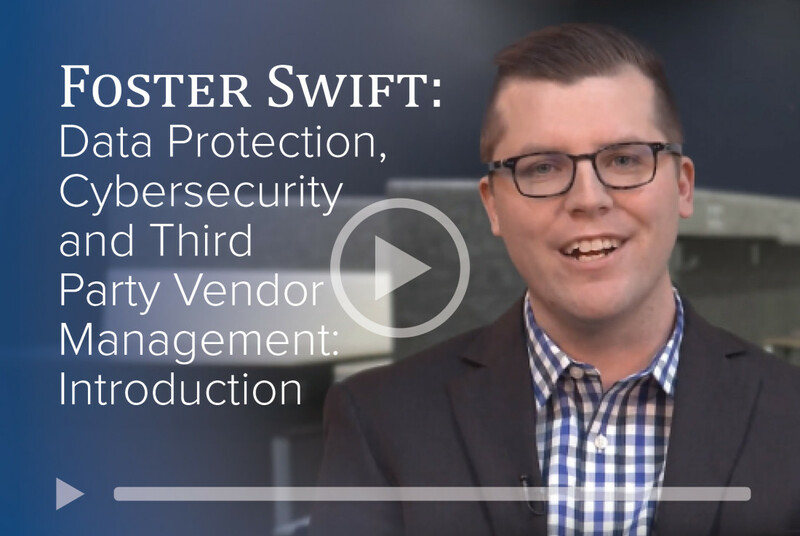 In this video, Foster Swift business attorney Taylor Gast gives an introduction to these topics along with a brief take on the best practices for a business to adopt to prevent data breaches. Also stay tuned as he will cover these topics more in depth in a later video. This video provides general information and IS NOT LEGAL ADVICE. If you seek legal counsel or need help in determining how this information applies to a specific situation, contact a Foster Swift business & corporate attorney before taking any action.